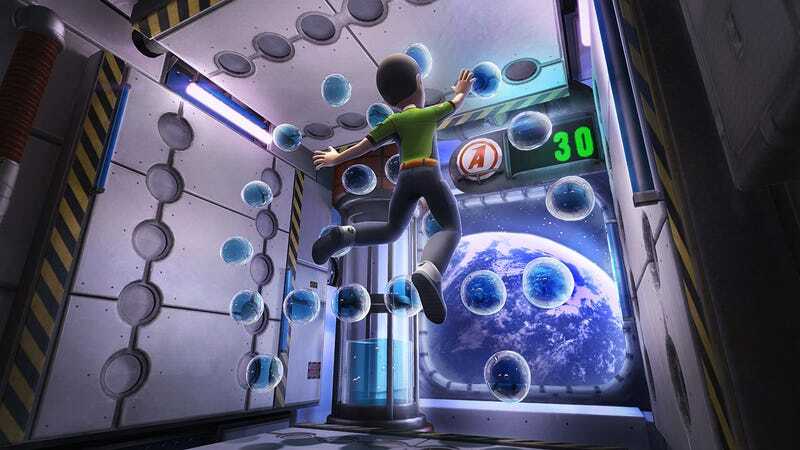 Kinect Adventures' five games are easy to play and fun to devote a half hour to. This likely isn't for people looking for a long, deep, plot-driven experience. If you pony up the cash to buy the Kinect camera and don't have any money left over for games, you'll be spending quite a bit of time with the included Kinect Adventures. This is the first game almost anyone who buys a Kinect will experience. More than any other launch title, Kinect Adventures is also the poster child for the Kinect, getting face time everywhere from the stage of E3 to an appearance on Jimmy Fallon and Oprah. What sort of games are included in Kinect Adventures The game comes with five sorts of activities, each with a collection of settings and levels. Kinect Adventures presents these games to players as a series of adventures. You'll need to play through all of the adventures and challenges in a difficulty setting to unlock new challenges and the next difficulty. The game includes four difficulty settings. The overall goal of the game is to become an "expert adventurer." When they showed the kick ball game at E3 it looked a bit out of control, how does it play? That's Rally Bal, you play the game by swatting and kicking balls at a wall of sometimes moving targets. As you play, the number of balls can increase, turning the game into the most frenetic of the bunch. Good Science Studio's take on breakout is engaging, but not something I'd want to play for more than a few rounds at a time. The rafting game is showing up a lot on television. Is it any fun? That's River Rush. It is my favorite of the bunch. The object of the game is to guide a raft down a river course, collecting as many icons as you can in the shortest time possible. You control the raft not by leaning, but by moving around inside it and jumping. Played alone it's a neat experience, but played with a friend it becomes a challenge of communicating and staying in sync. Kinect Adventures rewards players with living statues which you can animate with your own movements and voice. What is the most interesting game in Kinect Adventures? 20,000 Leaks, which has you controlling your avatar while he or she is submerged in a glass box. You have to use your hands, feet, legs, arms and head to plug leaks caused by the aquatic wildlife drifting by outside your box. Initially, the game is pretty easy, just making you plug a leak or two at a time with your hands. But as the game progresses you need to start plugging multiple leaks simultaneously, forcing you to essentially play Twister in the air. Once you start dealing with a web of shattered glass and four or five leaks at a time, the game becomes much more fun. What's the worst game of the bunch? Space Pop is a snooze fest. In it you have to pop bubbles that float between holes on the walls, floor and ceiling. The twist is that you're doing this in low gravity, so you can flap your arms to float to the top of the room. You'll also need to move forward and backwards in your room while playing to line up with the floating bubbles. It's a bit too slow and not challenging enough to make it worth the time to play. How is Reflex Ridge? Think of it as the Kinect's Mine Cart level. But instead of tapping buttons to speed up and wiggling a thumbstick to dodge things, you have to use your body to make it through the obstacle course on wheels. Your avatar is standing on a moving platform. You have to move back and forth, duck and jump to avoid obstacles that the platform is moving through and to collect icons. When you play with a friend, the game split-screens and it becomes a race. The obstacle course nature of the game is a great fit for Kinect. How does the game handle playing with other people? Kinect and the game both do a surprisingly good job of tracking multiple players in a room, making games like River Rush and Reflex Ridge, in particular, a blast to play. Online the game does just as well. My favorite of the bunch online or off, alone or with a group is definitely River Rush. Kinect Adventures is a wonderful introduction to Kinect's flavor of motion gaming. Playing a game with nothing in your hands takes a bit of getting used to but Kinect Adventures manages to both ease you into that experience and make the learning curve fun. Packed with four difficulty settings, quite a few levels in each activity and the ability to earn not just achievements but animated statues, Kinect Adventures is the sort of game you'll end up coming back to again and again. Kinect Adventures was developed by Good Science Studio and published by Microsoft Game Studios for the Xbox 360 Kinect, released on Nov. 4. It is included with the Kinect camera. A copy of the game was given to us by the publisher for reviewing purposes. Played through multiple adventures alone and with people on the same console and online. Played up to the expert setting. Played about 8 feet from the camera.